LOS ANGELES, CALIFORNIA, is the second most populous city in the UNITED STATES with an estimated 2002 population of approximately 3.8 million. Los Angeles (also known as L.A.) is the principal city of a metropolitan region with a population of over 12 million. 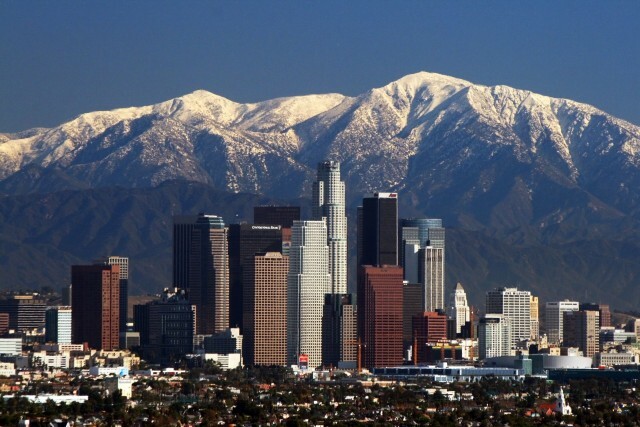 Located in the Los Angeles basin, the city is 470 square mi (1,215 square km). The extreme north-south distance is 44 mi (71 km), the extreme east-west distance is 29 mi (46.5 km), and the length of the city boundary is 342 mi (550 km). The San Gabriel, Santa Monica, and Santa Ana Mountains surround the basin. The city is bordered to the west and southwest by the PACIFIC OCEAN. Earthquakes are probably the most prevalent natural hazard that the residents of Los Angeles face. It is estimated that there are nearly 30 magnitude 2.0 and higher earthquakes in southern CALIFORNIA everyday. The last significant earthquake to strike the Los Angeles area was the 1994 Northridge quake, measuring 6.7 on the Richter scale. It claimed 61 lives and caused over $20 billion in property damage. The city’s name is attributed to the Spanish California’s military governor, Felipe de Neve, who founded a new settlement and named it El Pueblo de la Reyna de los Angeles (the Town of the Queen of the Angels). The name was eventually shortened to Los Angeles. Founded in 1781, Los Angeles was an outpost under a succession of Spanish, Mexican, and American rule. The city became incorporated in 1850 and got a boost following its linkage by rail with San Francisco in 1876. The city was selected as the southern California rail terminus because its natural harbor seemed to offer little challenge to San Francisco, home of the railroad barons. After the introduction of the rail link, the city began to steadily grow in population. The Mediterranean climate and vast open spaces mixed with agricultural and oil production, the creation of a deep water port, and the completion of the city-financed Owens Valley Aqueduct to provide additional water, all contributed to Los Angeles’s continued growth. The population swelled to 1.5 million by 1940. Following World War II, Los Angeles became the focus of new wave of migration, with its population reaching 2.4 million by 1960. The population topped 3 million during the 1980s. After the 2000 census, the foreign-born population was 1.5 million, which was 41 percent of the city’s total population. Racially, the city is a melting pot, in the 2000 census, 47 percent of the population identified themselves as white, 11 percent black, and 10 percent Asian. The white population percentage numbers include all those individuals who identified themselves as Hispanic or Latino. One in three residents in the metropolitan area was born outside the UNITED STATES. Los Angeles’s growth continues, anchored by its economic diversity. Services, wholesale and retail trade, manufacturing, government, financial service industries, transportation, utilities, and construction contribute significantly to local employment. Los Angeles County is the top-ranked county in manufacturing in the United States, producing more than 10 percent of the nation’s production of numerous items ranging from aircraft, aircraft equipment guided missiles, and space vehicles, to television shows, movies, games, toys, and clothing. The Los Angeles area is also a transportation gateway into the United States for both passengers and cargo. Fueled by trade with the Pacific Rim countries, the ports of Los Angeles and Long Beach combined rank first in the nation in volume. Los Angeles International Airport is served by 68 different passenger carriers and serves over 30 million passengers annually. The airport is the fifth-busiest cargo airport in the world, handling more than 1.96 million tons of origination and destination air cargo in 2002. The private automobile plays an important part of the Los Angles lifestyle. Los Angeles County has 527 mi (848 km) of freeway and 382 mi (614 km) of conventional highway. Altogether, there are over 21,000 mi (33,796 km) of public roads in the county. On an average day, 92 million vehicle miles are driven in Los Angeles County. As home to the film, television, and recording industries, as well as important cultural facilities, Los Angeles serves as a principal global cultural center. The area boasts 83 radio stations. Twenty of the stations are in Spanish and nine others are in languages other than English including, Chinese, Korean, and Iranian. Twenty-six daily and 86 monthly/weekly newspapers are published within Los Angeles. Among them is the only Danish weekly newspaper published in the United States and a large array of papers published in other foreign languages. The Los Angeles area is home to 29 television stations. Included among these stations is KSCI Channel 18, which is Los Angeles County’s most linguistically diverse television station and the leading Asian language television station in the United States. It provides programming and entertainment in 14 languages, including Arabic, Armenian, Khmer, Cantonese-Chinese, English, Farsi, Hindi, Hebrew, Japanese, Korean, Mandarin-Chinese, Tagalog, Urdu, and Vietnamese. Los Angeles, like its sister city NEW YORK, is a multicultural metropolis.